Stop Spasms of the Low Back, Glutes and QL (quadratus lumborum) with targeted trigger point therapy. Accomplish at home what used to only be possible at the hands of a trained therapist. The Low Back Tools are the small "double humped" forms that are designed specifically for the lower back and target muscles very close to the spine. The Low Back Tool can be used by itself or in pairs. The base is there to accommodate thicker carpet pile, varying anatomy or simply because it feels right. The tools in the Low Back Kit force the muscles of the low back to relax by leveraging your own body weight to apply pressure. For Therapists: The Low Back tool is designed to target two vertebral bodies anywhere between L2-S1. With these tools you can focus extension of specific vertebral bodies, while applying trigger point therapy to the erectors and multifidus. This Kit includes a Small Knot Finder to target Trigger Points further from the spine and above and below the pelvis. (e.g. QL and Glutes). 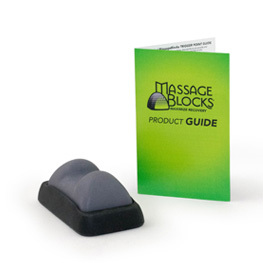 This amazingly versatile tool is great for a majority of Trigger Points found on your body. The more you use the Small Knot Finder, the more you are surprised by it's capability. Please see our Warning and List of Red Flags. 2 Low Back Massage Tools. All Parts Patent Pending, Recyclable and Made in USA.